The popularity of home laser and IPL hair removal kits have been on the increase since their introduction at the end of 2005, however do they actually work? Frustrated with the lack of understanding surrounding the efficacy of these kits, we took the time to look at the scientific data surrounding home hair removal devices, and what we found was surprising! What is a Home Laser / IPL Kit? Are They Safe for Use? How Popular are Home Laser / IPL Kits? What are the Typical Results of Home Laser / IPL Hair Removal? Are Home Laser / IPL Hair Removal Devices Safe? Who Do I recommend Purchases a Home Laser Hair Removal Device? A home laser hair removal kit is a product that can be bought since 2006 that allows customers to self administer laser treatments. The cost between $200 and $700 to purchase and ​are becoming more and more popular among customers due to cost savings (as compared with professional laser hair removal or electrolysis) and convenience factors. How does laser hair removal / IPL work? The light is absorbed by a substance called melanin that is found both in skin and hair and is responsible for pigment of both. The darker the pigment, the higher the concentration of melanin. Heating up of the target area causes localised damage to the hair follicle and causes the desired hair removal effects. Later on in the article we look at the evidence surrounding home laser hair removal. The high level overview is that certain home laser and IPL kits have been shown to be both safe and effective for hair removal on skin types up to IV on the Fitzpatrick scale. The FDA has approved a small number of home laser / IPL kits so that they can be sold directly to the consumer. These devices contain certain safety features that prevent the user from doing unsafe things that may cause physical harm. Lasers and IPL give very similar results in terms of hair removal although they work in a different way. In high level terms: lasers are focused on a single wavelength, while IPL uses a full spectrum of light for treatment. For an in-depth analysis of the differences between laser and IPL then read our detailed article here. The graph below shows the popularity of three search terms "Home laser hair removal", "Home IPL hair removal" and "Tria 4x" (the Tria 4x is one of the most popular home laser hair removal brands). ​In order to get FDA clearance to sell directly to consumers, manufacturers of home hair removal devices had to jump through certain hoops to demonstrate safety. Part of this process involved lowering the "fluence" (power) of the device. Home devices are typically less than 20 Joules / cm2 whereas professional lasers can go up to 40 or more. In plain terms, it means that a professional can apply more power to a treatment area if deemed necessary.​ Obviously, the more energy that can be applied to the treatment, the more damage can be done do the hair follicle thus causing more permanent hair reduction results. The flip side of the coin is that the higher the fluence, the more chance of skin damage resulting from improper usage and discomfort during the treatment process. Home laser hair removal devices generally give less permanent results than those that can be achieved professionally after the treatment is finished. Current home laser kits come in the form of a diode laser. Neither diode lasers or IPL machines are suitable for treating skin types of higher than IV on the Fitzpatrick scale. For people with dark coloured skin then professional laser hair removal with an Nd:YAG laser is the only option. For more information about this, read our guide: The Truth about Laser Hair Removal on Dark Coloured Skin. Each participant had a skin type of I - IV on the Fitzpatrick scale. This mean their skin colour ranged from white/pale to light/moderate brown. Participants administered their own treatments with a home diode laser at 5.0 - 6.4 J/cm. Photos and assessments took place before each treatment and three months after the final treatment. The results were very interesting. Patients reported a 59% reduction in hair count during the treatment period. 77% also described the hair reduction to be from "moderate" to "much less hair" in treated than untreated axillary hair. There is an interesting discussion about the validity of these results and what we can actually conclude from them given that a more longer term assessment wasn't performed. Read here for a more in-depth look at this particular study. The participants had hair removal done in four patches. One patch was left as control, the other three patches received laser hair removal treatment at different fluences (power settings). 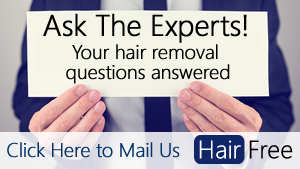 Hair counts were taken at each treatment and 12 months after the final treatment. 12 months after the final treatment 86% of subjects had greater than 30% hair reduction and 38% had greater than 80% hair reduction. On top of this, 31% of subjects reported complete (100%) hair removal. One thing that's interesting to note: Even the lowest power laser setting in this study is higher than the power of the laser in study 1 (above). This may account for the reason why the results in the second study were far more impressive than the first given the clear correlation between power and hair reduction results. Treatment area was not specified other than being "non-facial"
Mean hair reduction was 36% after four weeks and 10% after 12 weeks. Only minor, transient side effects were reported. The power setting (fluence) of the IPL device used in this study is undisclosed. This is quite an important detail that would give us greater insight into the study and why the results aren't as impressive as other studies that have been done. Hair counts, photographs, side effects and satisfaction scores were also gathered at 1, 3 and 6 months after the final treatment. Hair counts were reduced by between 37.8% to 53.6% at 6 months after the final treatment. 25% of patients suffered from temporary redness and irritation as a side effect of the treatment. The mean hair reduction was 44.3% at 2 weeks after last treatment, 33.6% at 4 weeks following last treatment and 32.3% at 12 weeks following last treatment. Side effects noted during the study were all temporary and included erythema (redness), edema (swelling), hyperpigmentation (darkening of skin)​, crusting, hypopigmentation and blistering. All side effects were resolved at 12 weeks after the final treatment. This study was very short with patients self administering only two treatments. It would be interesting to see hair reduction rate data for patients who followed a full 6 - 8 session treatment program that is often advised by the manufacturers. Marketed for people with light skin - The devices are marketed for people with light skin colour with Fitzpatrick skin type rating of I - IV. Low fluence - In order to get FDA approval, the power of these home based hair removal devices is a lot lower than the lasers that are used professionally. They typically operate at < 20 Joules / cm (2) and this is not a high enough fluence for more permanent disfiguration for those with light skin colour. The other area of concern is optical safety. Some studies have been carried out to measure optical radiation of home hair removal devices in relation to recommended guidelines on exposure limits. Eadie et al concluded that the home IPL hair removal machine they assessed did not present an optical hazard according to currently available international standards. Rohrer et al also concluded that with adequate training and instruction, patients may administer self-treatments for hair removal in a safe and effective manner. Regarding eye safety, it should be noted that both of the two FDA approved home laser hair removal devices have a safety feature that prevents the laser from firing unless it's pressed up against a hard surface. This is to prevent users from accidentally firing the device while looking into the laser. Other popular products, such as the Philips Lumea hair removal kit, are not FDA approved. We always recommend that you use an FDA approved product. There are two main schools of thought when it comes to home laser hair removal. The first is that home laser hair removal products don't work and are a waste of money and the second opposing school of thought is that home laser kits are equally as good as the lasers that professionals use. The real truth is that neither of those schools of thought are correct. Likely to get you some results - If you have a skin type of between I and IV on the Fitzpatrick scale then home laser hair removal will probably get you some results. It's true that some people don't respond to the treatment, but it's also true the majority do. Results are less permanent than professional hair removal - the fluence of home laser / IPL hair removal kits is a lot lower to ensure the user's safety. The knock on effect of this is that the follicle is damaged less and thus hair reduction doesn't last as long. Evidence of this can be seen with some studies that have shown significant hair regrowth at 3 months after the last treatment in home hair removal devices. Not suitable for darker skin types - People with Fitzpatrick skin type of above IV will need to consider professional laser hair removal with the Nd:YAG laser or electrolysis as an alternative form of hair removal. The FDA approved devices are safe - Numerous safety features are required for FDA approval and the conclusion of studies looking at the safety of home hair removal devices is that they are safe for home use. There are numerous non FDA approved products on the market - Be sure to only purchase an FDA approved product to ensure maximum safety during use. Side effects are transient - There haven't been any reports of permanent side effects in any of the studies. Most people will suffer with redness after treatment. Some will also experience transient swelling and a low percentage of people will suffer from temporary skin pigment changes. Can offer a significant cost saving - It's not unusual for professional laser hair removal to cost in excess of $10k for a full series of treatments over a relatively large treatment area. Given that home laser hair removal devices come at a one off cost, a significant cost saving can be had. Some devices require "Refills" - Some home hair removal devices come with light cartridges that can flash a certain number of times before they need to be replaced. Do your homework and make sure that you understand how many treatments can be had from a single cartridge and how expensive new cartridges are. One particular brand, The Silk'n SensEpil, has a very low price for the unit, but cartridge prices are notably more expensive than their competitors. I think it's important that expectations are managed before a purchase of this magnitude is made. While home laser hair removal kits can be useful for some people, they aren't for everyone. The cost saving, convenience factor and privacy of doing it in your own home advantages are offset somewhat by the less impressive long term hair reduction results. If you want to cut down on the amount of time you spend using other hair removal methods such as waxing and shaving and would be happy with a decent percentage reduction in hair count ​on your treatment areas then home laser hair removal kits might be a good fit for you. Also, if you don't have the funds required to go ahead with full professional laser hair removal or electrolysis but are fed up with the shorter term hair removal methods, then this is a decent place to start. If you're happy to apply the treatments every 2 weeks for an extended period of time, then the statistics will say that you're likely to get a significant reduction in hair count as the best results with home laser hair removal come from consistent usage. If, however, you're results oriented, have the budget, are happy to schedule visits and would like to maximise the hair reduction percentage for the longest period of time then you should see a professional. Their lasers cost > $10k per unit, are operated (usually) by fully trained professionals, operate safely at a higher fluence and consequently do a better job at permanent hair reduction. If you've decided to go ahead with home laser / IPL hair removal treatment, then I can recommend you check out either the Tria 4X or Silk'n SensEpil. (Update: see here for a full and complete round up review of home laser hair removal kits). Both devices have good scientific data behind them, are FDA approved, have been around a while and are top products in the market. The SensEpil is cheaper to begin with but refills cost more.​ Click on either model below to read our review and figure out which one is right for you. The Silk'n SensEpil is also a top selling product. Instead of being a laser device like the Tria, it's an IPL device. Clinical study to determine the safety and efficacy of a low-energy, pulsed light device for home use hair removal. Hair removal with a novel, low fluence, home-use intense pulsed light device. Effect of a novel low-energy pulsed-light device for home-use hair removal. Can patients treat themselves with a small novel light based hair removal system? Are home-use intense pulsed light (IPL) devices safe? Assessment of the optical radiation hazard from a home-use intense pulsed light (IPL) source. Measurement of home-use laser and intense pulsed light systems for hair removal: preliminary report. Home-use laser and light devices for the skin: an update. Quantitative assessment of growing hair counts, thickness and colour during and after treatments with a low-fluence, home-device laser: a randomized controlled trial. The role of natural and UV-induced skin pigmentation on low-fluence IPL-induced side effects: a randomized controlled trial.